Workshops and classes are currently on hiatus. Please check back later for updates. Limited private lessons will be available. Email elly for cost and availability. This 3-day popular, comprehensive and successful class is designed for adults who want to the learn the basics and for those with experience who want to get better results and expand their knowledge about painting - in a comfortable, non-competitive atmosphere. This is a no-intimidation zone! Through a series of simple, but fun paintings and exercises, you’ll learn how to get the most for your money and avoid wasting money on supplies. You will gain skill in brushwork, color and value, pigment behavior and personality, mixing color, washes and all sorts of resources. Texture techniques, composition & design, perspective, planning a painting and handling different subject matter are among the many concepts included. No experience in drawing (or watercolor) is necessary – really! 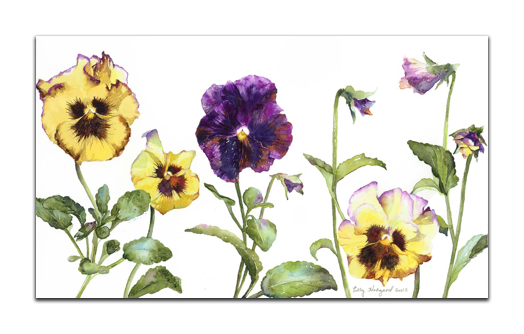 Want to learn to watercolor – or maybe you’ve painted with watercolor and didn’t get the results you want? Come to the Cherokee Art Center and learn! Three jam-packed days of tips, techniques and insider secrets will get you started right and make learning painless and fun. You absolutely do not need to know how to draw for this class! The course includes all you ever need to know about the essential supplies and how to use them – but how to save money when buying supplies. It includes brushwork, the secrets of pigment behavior, a bit on color theory, how to avoid making “mud”. You’ll learn how to create beautiful texture and how to easily correct your mistakes. All this and much, much more is included and you ‘ll learn this while creating a different painting each day! 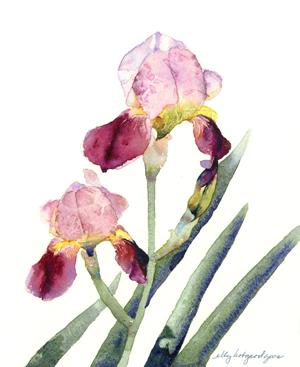 Elly Hobgood has been teaching and helping people learn to enjoy watercolor painting for more than 10 years. 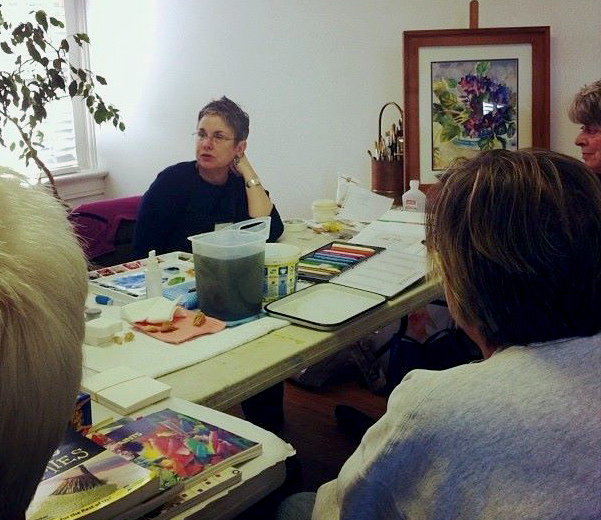 Each participant in the Watercolor Support Group will bring their own personal painting project to the sessions – what you are inspired to paint, along with their supplies, energy and ideas. Elly will be available to provide personalized feedback, guidance, objective advice and suggestions to support your inspirations – she may pull a helpful book from her watercolor library or an article out of her file, or a new tool for you to try - suggest a new color or give you a squirt of paint if you don’t have the right color. If you are working on a new direction, she has a wealth of resources to get you started. If you are stumped for a project, she has tons of reference photos or a file of past Paintgroup projects you might use. Bring a sack lunch . She’ll have snacks and a pot of coffee brewing or hot water & teabag ! Support Group will be in session on the first Wednesday of each month from 10:30 am to 2:30 pm and/or the first Saturday of each month from noon to 4 pm. Therapy will take place at Elly’s home studio. To reserve a space [space is limited] or get directions, drop Elly an email at ellyhob1591@aol.com. The first Wednesday and the first Saturday of each month. Saturday session: noon to 4 pm Space limited. group workshops [3 –day or 5 – day] are available in your location. Contact Elly at ellyhob1591@aol.com or 678-880-2903. We call Elly's approach to teaching - "EDUTAINMENT !" Copyright © 2008-2019 Elly Hobgood.